I am happy to share with you a picture of Granny's doll, Lucy. 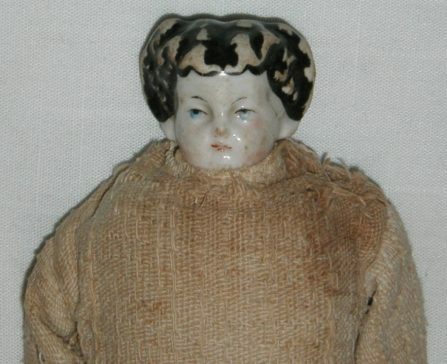 As you know, Granny's mother made the doll for her when she was a little girl. (I don't know how old.) Granny gave the doll to me when I was fifteen years old. (I am sixty-nine now.) The picture of the doll is prettier than the doll, of course, since the body was made from sand. The clothing is original and grayish because of the sand and the age. I wish I had thought when she gave Lucy to me to find out more about her--it is sand-filled and has homemade clothing. The card I have stored in the box with Lucy has a date of 1879.